The Radio Flyer wagon is our secret weapon. This classic form of kid transport has been around for decades, but its current form is highly evolved. The cadillac of Radio Flyers is the Pathfinder, a two-seater hard plastic wagon with seat belts and a storage compartment underneath. We’ve been using this wagon since before the twins were born, and people are always asking about it. One of the reasons we love the Pathfinder so much is that its just a well-made wagon with lots of features to like. Solid hard-plastic construction. It’s quite sturdy and durable, and we’ve certainly put our wagon through its paces. Even so, I like the plastic material better than Red Flyer’s original metal, which can dent or rust. Flip-up seats with seat belts. At first glance, the Pathfinder looks much like the classic Radio Flyer Wagon. Then you flip up the two seat-backs, and it’s almost like a stroller. Lap belts on each side can hold your little ones snugly in place (we’ve even tested them on fairly steep hills without issues) and the seat backs provide excellent support. Plus, it’s a more comfortable sitting position than a classic wagon. Easy turns with pivoting front axles. The front double wheels are on a pivoting axle, and an extra-long handle makes the wagon very easy to handle. Remember how you used to have to force a Radio Flyer into awkward, tip-inducing turns? No longer. Built-in cupholders. This is quite possibly the most important improvement to the wagon: a double built-in cupholder on each side. 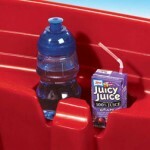 We use these to store bottles, sippy cups, toys, and other loose items. The kids love them. Heavy duty tires. They’re thick, plastic, and take the bumps well. We’ve rolled them across cement, gravel, grass, and other surfaces and they hold up quite well. To the NICU when our twins were born. It was our 2-year-old’s fortress and entertainment center. We loaded the other seat with books, toys, and snacks. 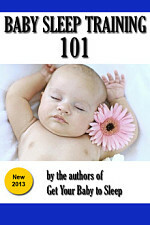 She stayed in the wagon, safe and contained, rather than wandering around the hospital. Well, most of the time. The nurses loved watching us roll in and out. On walks around the neighborhood. The only downside is that it sometimes gets us too much attention from the neighbors, and we can never get home! To our daughter’s swim lessons. 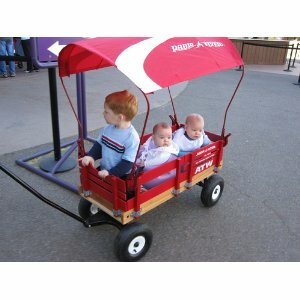 Our twins (14 months) lasted longer in it than in the stroller, and they could see better too. They got a lot of attention! Out in the backyard or the park. The boys aren’t to the point where they can walk around on uneven ground, so we often leave them in the wagon, letting them participate in outdoor play without getting dirt or itchy grass all over them. Hauling goods and groceries around the house. Just tonight, the Radio Flyer served as a storage bin and organizer for a bunch of groceries while we ran errands. It’s useful like that. 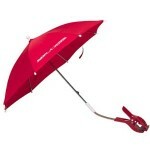 If you’d like a little weather protection, check out the adorable Radio Flyer clip-on umbrella accessory. This jaunty red umbrella is made of tough polyester, turning your Radio Flyer into a sort of “conestoga wagon.” It clips on to any Radio Flyer: the Pathfinder (which we have) or the classic model. The umbrella’s clip is a flat, slip-proof clamp that adjusts from 1/8″ to 2″, allowing you to attach it to a beach chair, a deck rail, or whatever. 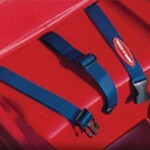 It’s a great and stylish form of protection to keep handy in case of super-hot sunny days or sudden rainstorms. One potential disadvantage of the Pathfinder wagon is that it’s open-topped, leaving the contents (or kids) exposed to sunlight or rain. 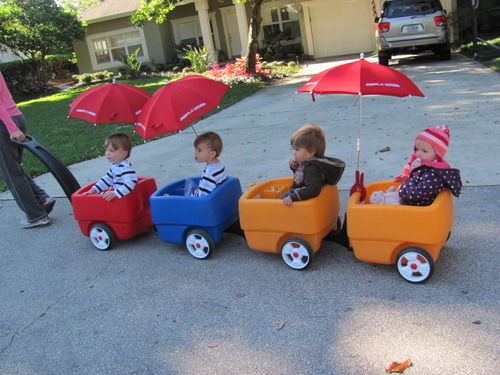 Usually we address this with hats and sunscreen, but there’s another option: the Radio Flyer Wagon Canopy. Yesterday, while at a crowded outdoor summer festival, we saw a mother of three with a Pathfinder wagon complete with this canopy. It was a warm, sunny day, and her kids were just loving their wheeled “conestoga” kingdom. It kept them shaded and contained while they could still look around 360 degrees and see everything. 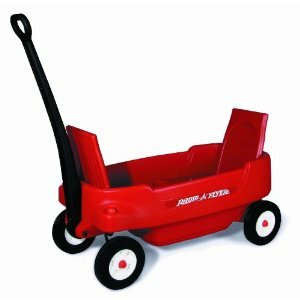 Matching red color (bright red) with Radio Flyer name – sure to draw attention! 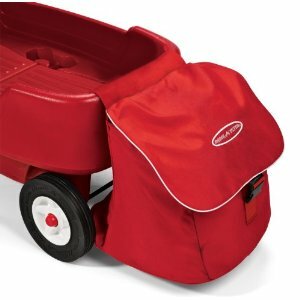 There’s another great accessory for the Radio Flyer, one that comes in handy if you’d like to haul some extra baby gear or toys around. This XL storage bag measures 15 inches by 15 inches by 16 inches, and holds up to 20 pounds. It attaches to the back of any Radio Flyer wagon. These bags are great if you want to pull multiple kids around in the wagon (this doesn’t leave much cargo space). Or, if you’re pulling just one kid who likes to toss things out of the wagon. For some additional great “babytainment” ideas, check out our article on 6 Ways to Contain and Entertain Your Twins. We love, love, love our wagon!!! It’s how our twins prefer to roll too.